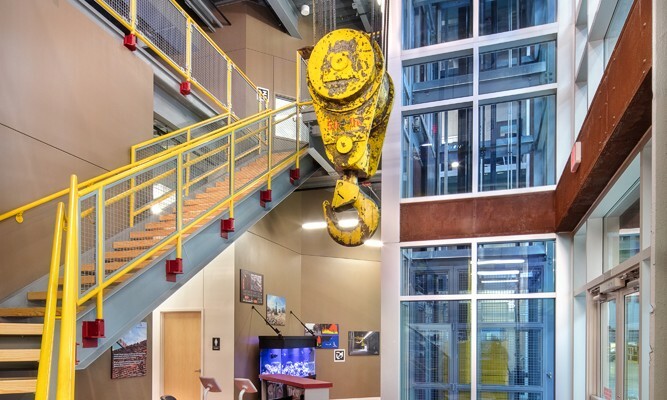 A long-term investment to convert a former steel mill in Lawrenceville into space for Carnegie Robotics helped to boost Pittsburgh’s status as a place for robotics companies, and now the mill redevelopment has become a model project for commercial real estate developers. Though its executives knew such research held great potential, the Regional Industrial Development Corporation (RIDC) could not have anticipated that robotics would bring more than 1,500 jobs to Pittsburgh in the 15 years after RIDC bought the 14-acre Heppenstall Steel Company site that’s visible from the 40th Street Bridge, says Tim White, RIDC’s senior vice president for development. 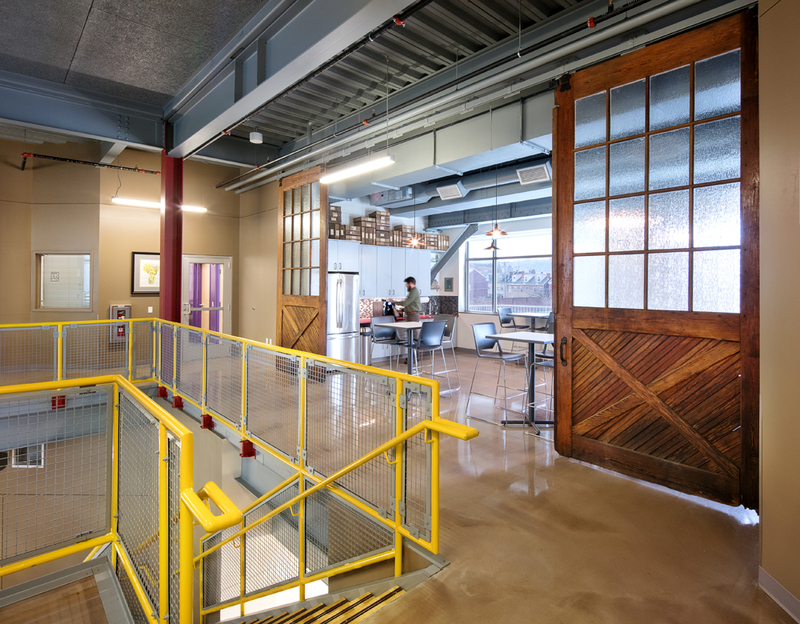 Carnegie Robotics interior, courtesy of RIDC/Desmone Architects. NAIOP, a leading organization for developers, owners and investors of commercial real estate, chose the redevelopment of Heppenstall’s Blue Building into a home for Carnegie Robotics as one of three top 2017 impact projects. Members of the leasing, design and finance team from RIDC, Desmone Architects and the Pennsylvania Department of Community and Economic Development will share what they learned during the project at a NAIOP conference March 8-9 in Toronto, Canada. A survey released in October by the Pittsburgh Robotics Network found that since 2011, Pittsburgh has generated 19 new businesses that provide robotics solutions to industries such as agriculture, defense, mining, health care, industrial inspection, transportation, and warehouse automation. The 40 robotics companies and research institutions associated with the network added more than 1,500 jobs to the economy—a 300 percent growth in employment—during those five years, the survey found. RIDC has invested at least $10 million to remediate the brownfield site that remained when Heppenstall closed its mill in 1979. In 1996, RIDC purchased a warehouse that became home to Geoffrey Boehm Chocolates; when the company went out of business, RIDC renovated the building as The Chocolate Factory to accommodate high-tech companies. Seegrid, a pioneer in autonomous 3D Vision navigation, became its first tenant but outgrew the building, which now houses RedZone Robotics, nanoGriptech, and Helomics. In 2002, RIDC purchased the broader Heppenstall property for an urban technology park. At the 47th Street end, RIDC is building The Tech Forge, a $20 million project that includes office and high-bay space where Caterpillar Inc. will locate a research lab. RIDC calls the site its Lawrenceville Technology Center. It’s located within a few blocks of CMU’s robotics center, from which Carnegie Robotics LLC spun out as a private company in 2010. Steve DiAntonio, president and CEO of Carnegie Robotics, says the company needed space to design, build and test its products and found a supportive landlord in RIDC. Seventy people work at the Blue Building, a heavy industrial high-bay facility fitted with two new floors to house clean room assembly labs, research and development labs, office and conference spaces, warehouse and distribution areas, and space to manufacture large robotic apparatuses. With technology bringing new industry to Pittsburgh, “there are many buildings with supporting infrastructure throughout the region that can be converted in a similar way,” he said. 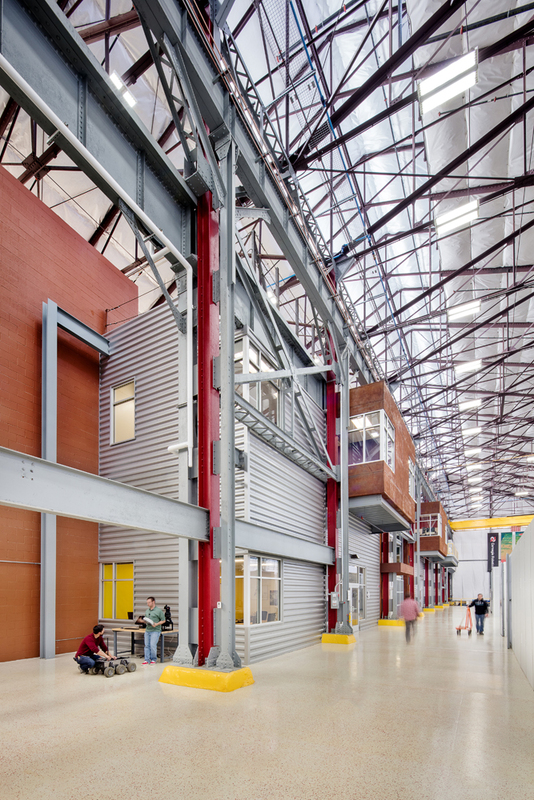 Carnegie Robotics second level common area, courtesy of RIDC/Desmone Architects. Pittsburgh’s robotics cluster in Lawrenceville and the Strip District grew as “a matter of time,” says DiAntonio, who started robotics work in 1999. “The technology’s matured and gotten less expensive, so that’s enabling more applications, real applications that people can afford.” Investment in driverless cars will motivate other industries to consider autonomous applications, he says. Carnegie Robotics founder John Bares left the company to help establish Uber’s Advanced Technologies Center in the Strip, which employs 600 people. Google has a team pursuing self-driving cars and, boosted by investment from Ford Motor Company, Pittsburgh startup Argo AI last month said it will add 200 jobs this year to produce self-driving cars by 2021. Other robotics firms in Pittsburgh include RE2, Edge Case Research, Arin Technologies, Autodesk, BirdBrain, and Bosch Research and Technology Center.